The North's state-run Uriminjokkiri website said it would amount to a form of "psychological warfare". 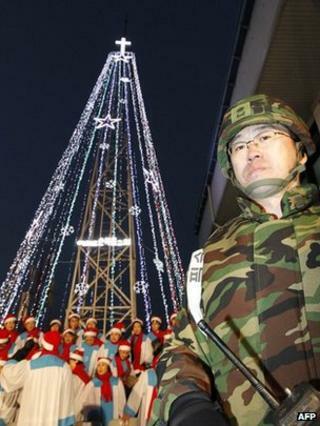 Seoul's annual tradition of lighting up a Christmas tree tower was suspended in 2003 following a warming of ties. However, the South lit a tower last year as relations deteriorated between the neighbours. The Associated Press quotes a defence ministry official as saying the South has agreed to allow Christian groups to light a further two towers this year. The official says the towers will be located in the western, central and eastern parts of the border and security will be tight during the 15 days they are lit, beginning on 23 December. The tree-shaped, 30m-high steel structure on Aegibong hill - some 3km (2 miles) from the border - was illuminated by thousands of small light bulbs last year. It could be seen from the North's major city of Kaesong across the border, according to media reports. Pyongyang has previously accused Seoul of using the tree to spread the Christian message to people inside the atheist state. Relations between the two Koreas have been tense for months. South Korea blames North Korea for sinking one of its warships in March 2010 with the loss of 46 lives - a charge Pyongyang denies. Tensions were further strained in November 2010 when North Korea shelled a Southern border island, killing four people.